Kate’s (and everyone else’s) favourite! Served with summertime’s fresh raspberries and peaches (or in winter, frozen berries and canned peaches), this version of a pancake breakfast is a stellar riff on a classic tune. Maple syrup is a splendid accompaniment! Preheat oven to 225 F and put in a metal or pottery serving tray to warm. Preheat an electric griddle or frypan on the stovetop to 350 F and brush lightly with a tsp oil/tsp butter. Blend flour, baking powder, soda and salt with spices in a medium-sized bowl. Whisk together molasses and honey with egg, yogurt and melted butter in a small bowl, then add to dry ingredients till just combined. Dip a ¼ measuring cup into the batter and spoon onto the heated griddle. This recipe makes enough for eight pancakes: one griddle full. If the all my family is coming for breakfast, the recipe needs to be quadrupled, but you may only need a single or double batch. Once bubbles appear on the pancake surface, they’ll be golden, and it’s time to flip them over for another 2 minutes or so till they are golden brown and lusciously ready to eat. Place decoratively in overlapping circles on the serving tray in the warming oven as each batch is cooked. 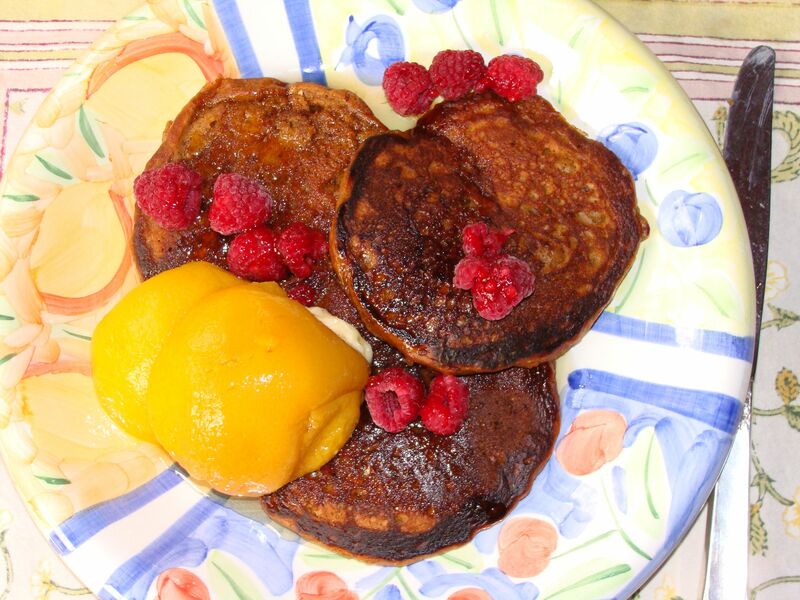 Gingerbread pancakes are luscious served with any kind of soft fruit (berries, peaches, apricots, apples cooked with a tbsp of butter and tbsp of apple juice and then carmelized once cooked with a tbsp brown sugar). I usually make a fruit smoothie as well, and a French press of strong coffee. Blend for a few minutes until the fruit is well mixed. Serve in wine glasses or martini glasses with a fresh or frozen berry slice to garnish.